Notebooks, boxes, scissors, pencils, pens, ruler, rubber or a well-equipped backpack are some of the supplies that the smallest of the house must meet to undertake, feared for some and desired by others, back to school. We propose the following school supplies Disney that will not leave indifferent your children, are joining us in this new adventure? The summer is the time of year dedicated to pure entertainment and, ultimately, to let our imagination to live in the world of dreams for a few days. Unfortunately, everything that has a beginning also has an end, like it or not. The latter is what happens with the summer holidays. His conclusion implies for little kids the beginning of a new school year. For some it is presented as the ideal place to meet your friends again and recounted his adventures moment, but for others it is a real workhorse that they will face the next 10 months. Apathy, sadness, inattention, anxiety or irritability are some of the clearest symptoms that make up the post – holiday syndrome children. 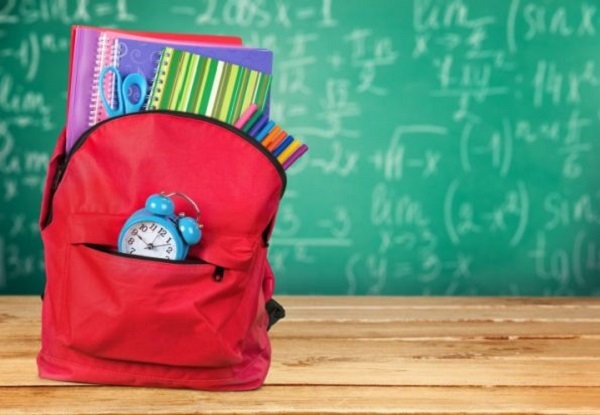 To help our children to undertake back to school, experts bring us some tips to consider. First, it is essential to adapt the school schedule one or two weeks before the course begins, marking the time to go to sleep and wake up. Necessary – also would help to review some of the basics of subjects, at all times taking your questions and responding to their concerns and fears. To Release the possible stress that can be generated inside for back to school, ideally it proposes to perform physical activities in the evenings as walking, cycling or skating instead of staying locked at home playing computer or the game console. No inconsiderable would not talk about the benefits and things positive that the return to school can provide them as meet new friends, reconnect with old ones, take excursions and learn new ideas. On the other hand, it is necessary to help them prepare for school supplies and buy the books they will need in the next course 2016-2017. From our blog of education we offer some school supplies that your children marvel. We thought, why not merge the world of studies with fantasy and dreams to undertake this coming back to school? Surfing the Net, we found places like Little Giants, in which we came across digital showcase products accompanied by the image of some of the characters Disney favorite little ones. We believe that children should never abandon their dreams, not even when undertaking the return to school. For this reason, we want to bring with them some of their favorite characters from fiction. He is taking advantage of the fever that the film Frozen has generated hundreds of countries around the world you cannot miss this child backpack with logos Elsa, Anna and Olaf. Pink, Frozen product has a main compartment, zipper, mesh side pockets and adjustable to hang back tapes. The Smaller also they enjoy being introduced in the world of race cars with materials like this exclusive backpack Cars daycare. A main blue box, close zipper and adjustable to hang back tapes, this backpack in red and has the character of Lightning McQueen as a protagonist. Another Product perfect for back to school would be this shoulder bag to store your essential class, with the daughters of the most famous Disney villains. Evie and Evil, heiresses and the Evil Queen Maleficent, are the stars of “The Descendants”, the new Disney, which now can take with you to school. This bag in purple and gold color has flap closure and zipper. There Is no doubt that snacks and breakfasts are critical to the growth of our children. For this reason, you must not miss the opportunity to get this postmeridian with the logo of the famous Mickey becoming a selfie in blue and orange. Equally, for outings and playtime, these water bottles with the image of Princess Sophiawould be ideal to keep your drink nice and cool or hot. To Paint and to color their drawings, nothing better than this collection of paintings with the image of the film Planes Disney. It has a total of 8 models. They may also write down all your notes in this fantastic book with Disney princesses boli of a jewel made reality in pink and fuchsia. The Tsum Tsum Disney may also be present in this fantastic triple case with three separate compartments. It includes pencil, eraser, pencil sharpener, 4 rules, book, crayons and markers. And … what about us this cylindrical tank sharpener? It also features the Disney princesses as protagonists on a pink background. What other tools to gather school supplies perfect facing the back to school to this list? What do you like most of those exposed in previous lines with the characters Disney protagonists?